E-1048-S6xx smart power relays from E-T-A ElectroTechnical Applications provide a reliable solution for switching, protecting and monitoring PLC-controlled resistive, inductive or lamp loads in DC 24V systems. reliable protection against short circuit and overload of loads and load lines. Versions are available in ratings from 0.5 to 4A, all of which feature a width of only 12.5mm, helping to optimise space use. These new smart power relays are suitable for a wide range of operating temperatures up to +60°C without performance reduction. The triple functionality of E-1048-S6xx smart power relays as electronic relays, overcurrent protection devices and diagnostic devices makes them a powerful yet cost effective replacement for a range of plug-in connections, helping to avoid possible failure sources. 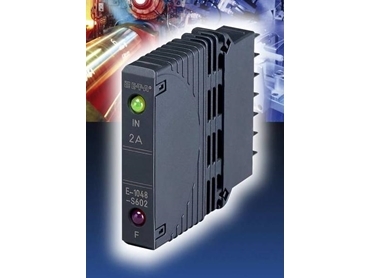 as a coupling component for programmable control units in automation.